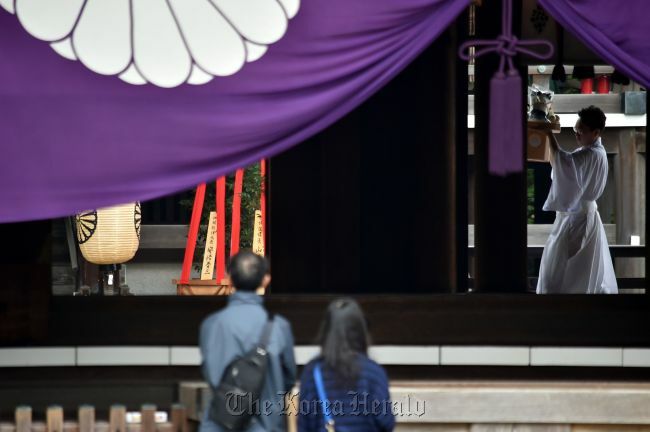 Japan's Prime Minister Shinzo Abe Saturday made a ritual offering to the controversial Yasukuni war shrine seen by neighbouring countries as a symbol of Tokyo's militarist past. Abe donated a sacred "masakaki" tree bearing his name as prime minister to coincide with the start of the four-day autumn festival at the shrine in central Tokyo, a shrine official said. But he will likely stop short of visiting in person, local media said, ahead of his planned visit to Seoul for a trilateral summit scheduled on November 1 with South Korea and China. Abe is also expected to hold his first official bilateral meeting with South Korean President Park Geun-Hye on the sidelines of the summit, Kyodo News and other reports said. His visit to the war shrine would infuriate neighbouring countries, especially China and South Korea, where the site is seen as a potent symbol of Japan's lack of penitence over its aggression during the first half of the 20th century. The Yasukuni shrine honours Japan's war dead, including some senior military and political figures convicted of serious crimes in the wake of the country's World War II defeat. The accompanying museum also paints Japan as a frustrated liberator of Asia and victim of the war. Abe and other nationalists say the Yasukuni shrine is merely a place to remember fallen soldiers and compare it with Arlington National Cemetery in the U.S. But Abe's pilgrimage to the shrine in December 2013 sparked fury in Asia and earned him a diplomatic slap on the wrist from the U.S., which said it was "disappointed".